MARTIN McGuinness has praised the Queen as a passionate supporter of the Northern Ireland peace process after they held their first ever one to one meeting. The Sinn Fein veteran and former IRA commander described his ten minute private audience with the monarch at Hillsborough Castle in Co Down as "very nice" and "useful". It was the Queen's third encounter with Mr McGuinness but their first on an individual to individual basis. Coming at the start of a three day visit to the region by the Queen and the Duke of Edinburgh, the meeting provided more evidence of the on-going efforts to normalise relations between Irish republicans and the British establishment in the post conflict era. Further proof will be exhibited publicly tomorrow when Mr McGuinness accompanies the Royal couple on a tour of the old Crumlin Road Gaol in Belfast - a prison the politician was detained in himself during the Troubles. "It was a very nice and useful meeting with Queen Elizabeth," Mr McGuinness said as he emerged from Hillsborough Castle. "Remember I am an Irish republican, I was an Irish republican when I went in there and I am still a very proud Irish republican, but I also have a very important ministerial position. My job is to represent everybody, my job is to provide real and positive leadership - that's what I am trying to do. "And I think in these engagements with Queen Elizabeth, and this is the third, I always see these as an opportunity to reach out, to stretch out the hand of friendship to the unionist community here in the north. "And I think from the contributions made by Queen Elizabeth it's quite clear indeed - her visit to Dublin, meeting me in Belfast two years ago, the visit to Windsor palace and again today, that she is someone who absolutely and passionately supports the peace process and supports big acts of reconciliation." 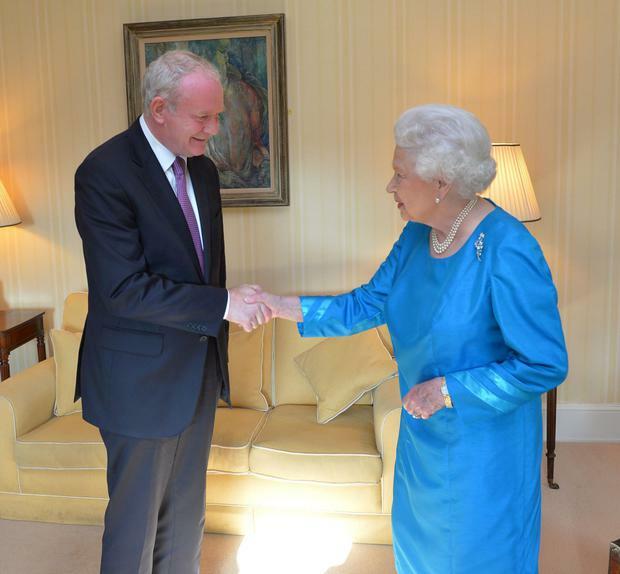 Before meeting Mr McGuinness, the Queen also had an audience with Democratic Unionist First Minister Peter Robinson. The DUP leader, who earlier commended the fact that an improved security situation had allowed the Queen's visit to be well publicised in advance, noted the significance of her encounter with Mr McGuinness. "I think the fact the deputy first minister is in sitting with an audience with the Queen at this moment perhaps demonstrates just how far we have come," he said. While relations between Sinn Fein and the Royal family are seemingly thawing, the Queen's latest visit comes at a time when a deep freeze has set in at the heart of the power-sharing institutions at Stormont. Political progress on big ticket issues has stalled, with Mr McGuinness and Mr Robinson unable to find consensus on how to deal with the long standing disputes - such as those on parades, flags and the past - that continue to block the road toward a fully shared society. As with a range of recent royal engagements involving Ireland, both north and south, the themes of reconciliation, regeneration and focusing on the future will be emphasised during what is the Queen and Duke's 21st visit to Northern Ireland. They landed earlier this evening at George Best Belfast City Airport where they were met by Northern Ireland Secretary Theresa Villiers and former Olympic champion and now Lord Lieutenant of Belfast Dame Mary Peters. While past visits have seen the Queen's itinerary closely guarded due to security fears, this week's engagements in the region have been publicised in advance. From the airport the couple were driven to Hillsborough Castle, their official residence in the region. On arrival crowds of well-wishers in the Co Down town cheered and waved Union flags. The Queen wore a Kingfisher blue coat and matching hat with a Shamrock brooch. The castle has recently been taken over by Historic Royal Palaces with a view to increasing visitor access. Michael Day, chief executive of Historic Royal Palaces, was among the official welcoming party that greeted the Royal couple. As the Queen conducted private audiences with Mr Robinson, Mr McGuinness, Mr Day and Ms Villiers, the Duke met participants in his well-known awards scheme. He talked with around 75 recipients of the Duke of Edinburgh Gold Awards. A packed day of engagements tomorrow includes a visit to the set of hit US fantasy drama Game Of Thrones in east Belfast. The Queen and Duke will tour the Painthall studios in the city's regenerated docklands where much of the popular HBO series is filmed. The Royal couple will also pop into the bustling St George's Market in Belfast city centre, be guests at a reception and lunch at Belfast City Hall and attend a garden party at Hillsborough Castle. The castle is also playing host to experts and crew from the Antiques Roadshow this week and the Queen and Duke will stop by to visit them during their stay. During her time across the Irish Sea, the Queen will also attend a Royal British Legion reception in Coleraine in Co Derry where she will launch a programme of activities commemorating the First World War. The Queen and Duke last visited Northern Ireland in 2012 as part of Her Majesty's Diamond Jubilee celebrations. That occasion proved highly symbolic in terms of the peace process as it marked the first occasion the she met Mr McGuinness.